The bigger they are, the harder they fall. Sure, my heart might be the darkest, coldest, deadest of hearts, but I still feel love for Mom, Leigh, Oliver, Ewan and even Jacob sometimes. Rarely, Goo and Nakamoto too, those turds. 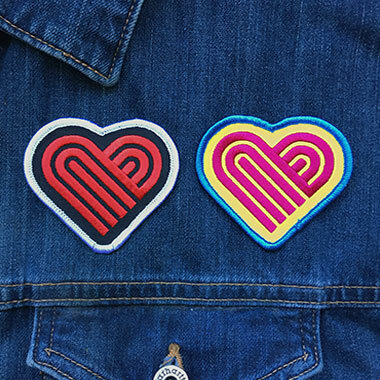 So I made a little “thick-lined” heart to remind myself that love is a magical thing, and, well, to let it fill up my life, head and shop, and lift me from the lightless hellhole that is the Draplin Design Co. up into the warm, golden rays of love’s shining mysteries. Something like that. Or, I just like thick lines. You pick. 02. Two colorways to from! “Blood Red/Black Heart” or “CMY Process Love”. 03. 3.0” x 2.625” in dimension.